Afghanistan’s former President Hamid Karzai has slammed the government in Kabul over a recent US bombardment of suspected Daesh terrorists, saying allowing the US military to use its largest conventional bomb in the country was tantamount to treason. Karzai, the most popular politician in the Afghan Pashtun community, questioned his successor, President Ashraf Ghani, for a decision to allow the controversial bombing. Ghani, also a Pashtun, is heavily reliant on foreign support for running Afghanistan. However, he has failed to garner the public support that Karzai used to enjoy during his presidency. Ghani’s office said the strike had been closely coordinated between Afghan and US forces. “Every Afghan has the right to speak their mind. 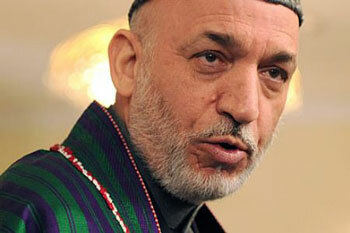 This is a country of free speech,” the office stated, in reaction to Karzai’s comments. Defense officials in Kabul have estimated that at least 100 militants of Daesh were killed after US jets dropped the 21,600-pound (9,797-kg) GBU-43 in the eastern province of Nangarhar. US military commanders have sought to justify the use of the bomb, saying it was necessary to target Daesh militants entrenched in booby-trapped tunnels in a remote mountain region. US commander in Afghanistan General John Nicholson said on Friday that military needs, and not political reasons, were considered in using the bomb. During his tenure as president, Karzai repeatedly opposed airstrikes by foreign military forces. Many Western governments, including the US, were at odds with him over the issue. The Thursday bombing marked the first time ever the US used GBU-43 in combat. The move was interpreted by many as a major shift of US policy toward Daesh in Afghanistan as officials in Washington earlier downplayed a threat, saying international efforts in Afghanistan should still concentrate on battling the Taliban rather than Daesh.